Although infinitely more pleasurable on a sunny, warm day, the trip to the islands where the Statue of Liberty and the Ellis Island Museum of Immigration are located reach full impact in inclement weather. You get a little bit of the experience that our forbears felt as they risked everything for life in the States. I can only imagine the hope that immigrants felt as they reached the harbor with Lady Liberty looming large. For many of them, there would be tears and misery once they reached Ellis Island…and that would be after an excruciating voyage, but this historical park (which encompasses both islands) is a must-see if you are going to New York City. 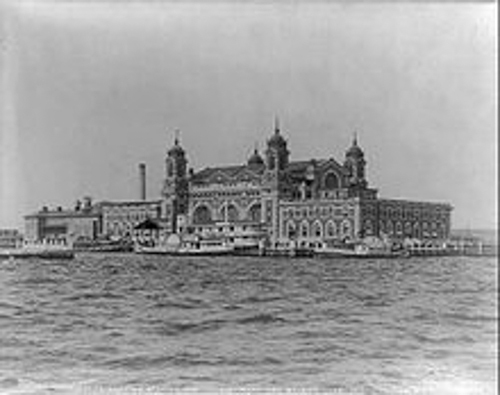 More than 12 million immigrants entered the US through Ellis Island from 1892-1924. Maybe you are one of the 100 million Americans who can trace their ancestry to an immigrant who crossed this island? Take an early ferry and visit both islands where you can wander around the parks, visit the monuments and museums, and learn a great deal about this influential period of American history. Warning—expect your emotions to be tugged. 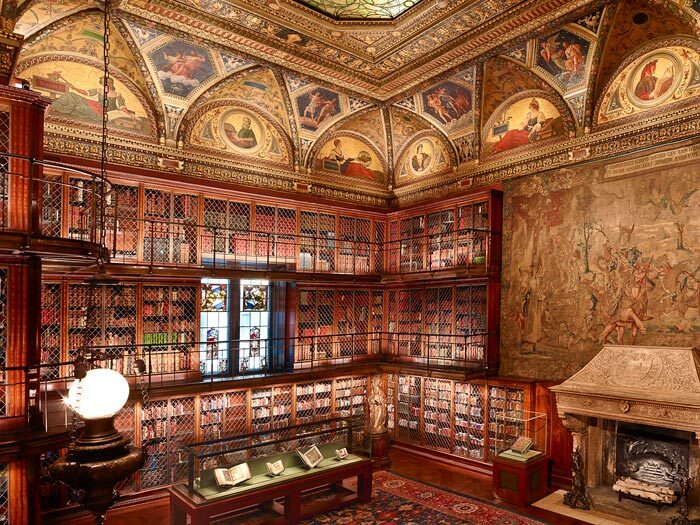 John Pierpont Morgan sure knew how to read in style. His library (built between 1902 and 1906) took me to another time (and class) when a vast library was an indication of a cultured person. The library gives you insight into his home, whereas there are also exhibits in the much more modern exhibition space attached to Mr. Morgan’s Library, Study, and Rotunda. The galleries are filled with treasures, including traveling exhibits of quite some renown. Each room is lavishly decorated and speaks to a gilded age. The library features three floors of bookshelves with frescoed ceilings, fabulous tapestries, and a monumental fireplace. The rotunda leading into the library reinforces that one is entering a space of greatness. Mr. Morgan’s study features paintings by Renaissance masters and much more. During the turn of the century, people poured into New York looking for a new life with grand hopes for financial stability. New York was a place where dreams could come true. 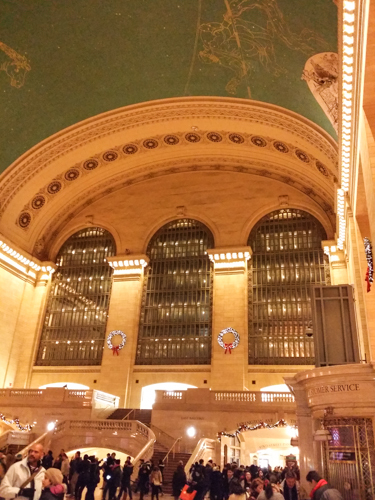 Travelers must have felt like they were living in a dream when they stepped off the railroad platform and entered the main concourse of the central terminal. With its soaring ceilings painted with constellations and the room’s rich architecture, I can only imagine the impression it made on weary travelers. As they exited the building, they would have looked up to see monumental sculptures of Greek gods on the facade. Their first impression was one of greatness and grandeur. Sadly, most of New York’s laborers would never come to know riches (or even modest comfort), but their city extolled extravagance. Since I first saw Ghostbusters, I have been in love with the New York Public Library’s 5th Avenue location. With majestic lions out front of its colonnaded portico, the entryway reminds visitors that reading is ritzy and elegant. The famous Rose Reading Room reinforces that image. With 52-foot high ceilings, massive windows, and grand chandeliers, the room invites thoughtful contemplation and inspires genius. Come at Christmas time to see beautifully decorated trees. At any time of the year, the New York Public Library’s Main Branch has changing exhibits highlighting books, papers, and letters. This Art Deco building may be slightly overrated…and the lines are excruciating, but the 102-story skyscraper provides a great view. If you don’t have the patience or the time to wait in line for the elevator (or perhaps you have a fear of heights), check out the beautiful Art Deco elevators in the lobby and the mural of the building there. Look at its lights at night. During the day, check out the griffin sculptures over the front entrance. If you do take the elevator ride up to the top, the view from the observation deck is quite lovely. Pick a warm, clear day though, since freezing on a swaying building with a limited view isn’t the most pleasurable. If poor weather makes it so you don’t feel like parting with $34 per person (for the basic pass not even the top floor! ), enjoy the lobby and try to remember how many movies have focused on this iconic tower of steel. There are plenty more things to do in New York City and some of the finest cultural venues around the globe including the world-renowned Metropolitan Museum of Art, but I promised to limit myself to five spots where history has happened in the City of Dreams. I hope that next time you’re caught between the world and New York City that you pick Manhattan. I only dreamt of visiting New York and it came true 2 years ago. Now why people call New York the city that never sleeps. It’s very different from the rest of the States, and is rather a country itself. I love its energy and agree with you that it’s quite different from other US big cities. Hi Amy, Grand Central is actually a terminal and not a station. Thanks, George! I stand corrected.